The science behind Value Add is laid out in Cracked Sidewalks pieces between May 2011 and now. A massive effort to upgrade the system and pinpoint the impact each player had on his team's Offensive and Defensive Efficiency Ratings culminated at the end of 2015 with Value Add Version 3.0, 1000 lines of code, a series of improvements detailed here, and a simple explanation with illustrative tables to make the impact of each player easy to understand. 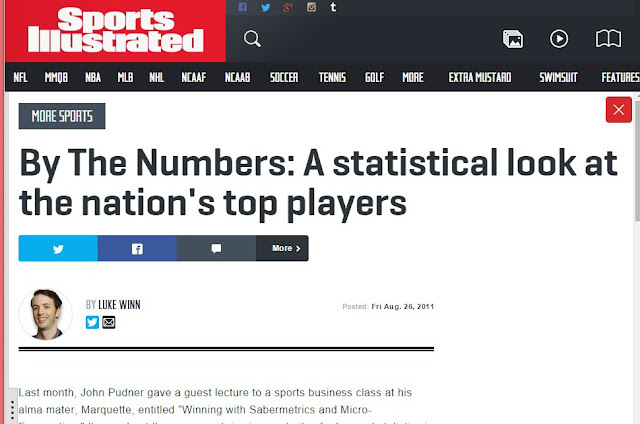 Articles on the Value Add Basketball system appear in places such as the University of Arizona basketball site, Big Apple Buckets, Bleacher Report, Breitbart (700+ articles), ESPN, ESPN the Magazine, Fox News, Fox Sports, Northwestern State University, the Times-Picayune, Sports Illustrated the Washington Post, blogs like Xavier Hoops Rumors and TV stations such as this one. The system is similar to baseball WAR. However, while WAR measures one "replacement player" taking the place of a start player, in Value Add pin points the number of POINTS each college player is worth due to the "domino effect" of the impact on the entire game rotation when the player is lost. John is now the Executive Director of Take Back Our Republic, a group working to find conservative solutions to the problem of money in politics. Anyone who wants to join that group simply needs to go to that page and type in their email and zipcode. From there we have played around with some offshoots, but none of these pretend to pinpoint value like Value Add Basketball does. 1. Baseball - The value of 250+ starting pitchers from 2014 and 2015 with every start detailed, and with an explanation of how the metrix can work when other systems fail.